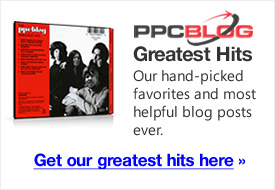 Not every Adwords campaign starts off with the geographic targeting perfectly dialed in. Often, marketers start by lumping a scads of countries in together, ignoring language and currency as well as differences in conversion rates from country to country. So how can you quickly segment out a country or group of countries that either need to have their bids customized (higher or lower), keywords tweaked, or daily budget settings adjusted? The quickest way in my experience is to create a carbon-copy of your existing multi-country campaign and make a few quick changes. To create a carbon-copy of your Adwords campaign to customize, use Adwords Editor. Do a CTRL-C to copy the campaign. In this case, we want to isolate Mexican traffic as we’ve found while it converts, the conversion rate isn’t high enough to sustain the same CPC bids as those used in the U.S., (about 50% lower in fact). *We could also change the language targeting to Spanish at this stage if we were going to translate all of the campaign elements. Important: Don’t forget to go back and remove Mexico from your old original campaign! What we really need to do with this campaign however is to bulk-reduce the bids without going into each adgroup and making individual bid changes. 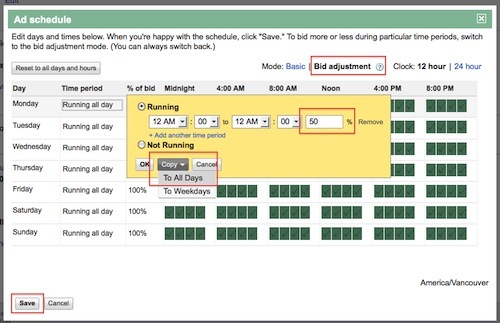 The easiest way to do this is to use the ad scheduling feature only available in the online Adwords UI. We’ve now effectively reduced our bids by 50% for Mexican traffic only. You can also make daily budget adjustments here to spend less budget on an ongoing basis. Splitting out high-traffic countries into their own campaigns and localizing your settings can also improve your quality scores, both in the campaign you’ve removed the extra countries from as well as the newly targeted campaign as quality score can often have a strong regional component.